Sleeping the right amount of hours hours each night is important for your overall health. If you get too little sleep, health problems will ensue. If you get too much sleep, health problems can develop. 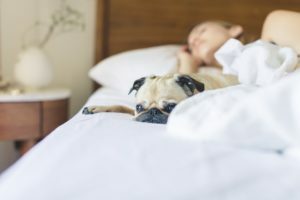 So what is the proper amount of sleep? Research shows that getting between 6-10 hours of sleep each night is optimal for good health. In a study published by the journal BMC Public Health, 133,608 Korean men and women were tested and analyzed about their sleep habits. The results showed that men who slept fewer than 6 hours per day had an increased rate of metabolic syndrome (pre-diabetes) and a higher waist circumference. Women who had less than 6 hours of sleep daily were more likely to have a higher waist circumference. This was an extremely large study which also highlighted gender differences. Metabolic syndrome and increased levels of triglycerides were more prevelant in men who slept longer than 10 hours a day. Women, on the other hand, had metabolic syndrome, higher waist circumference, increased triglycerides, as well as lower HDL (good cholesterol) levels if their daily totals exceeded 10 hours. Another study, published in the Journal of the American Geriatrics Society, showed that sleeping a short or long amount of time was linked to increased risk of dementia and premature death. Participants of this study were all over the age of 60. This highlights the importance of sleep, especially as we age. Interestingly enough, participants with high physical activity did not have a greater risk of dementia or premature death. Sleep is very important for your health. Make sure you get enough, but not too much. Sweet dreams.